Joey is my grandson. He is a wonderful young man in college and doing well. We all love his enthusiasm for everything he does. 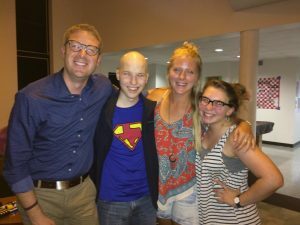 As a freshman on his first day at college, he went door to door in his residence hall inviting everyone to meet in the lobby and go to dinner together. Many joined him, and they had a great time. Later that month, he worked with one of the resident assistants and hosted an event where Joey would be teaching the Texas Two Step. That way, kids who didn’t know how to dance could feel confident enough to go out dancing in Austin on Thursday nights. Lots of freshman showed up. They were new at college and didn’t know anyone yet. Being away from home was kind of scary, and they welcomed the opportunity to meet new friends. Joey was a great teacher, and it immediately made him a leader in his residence hall—which was a job he loved. That is the kind of kid Joey is. The next year, Joey initiated an event called ‘Whataburger Wednesdays.’ Every Wednesday night at 11, he invited everyone to take a break from studying and go to Whataburger because that was when breakfast was served again and you could order the Honey Butter Chicken Biscuit. Those who had cars would stand in the lobby of the residence hall and hold up fingers for how many people they could take. When all those who didn’t have cars found a space, off they’d go. At first there were just 8; then there were 12 to 15. By the end of the semester, they had 62! 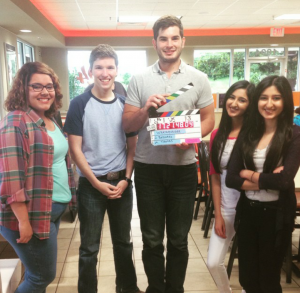 Corporate Whataburger got word of this and asked Joey to make a commercial for them about Whataburger Wednesdays. Amazing Joey! Soon after finals of his sophomore year, Joey started having vision problems and thought he needed glasses. He scheduled an appointment with an optometrist, but it was only the start. The optometrist could not tell what was causing it and referred him to an ophthalmologist who eventually ordered an MRI. By the end of the day, they found there was swelling pushing against his optic nerve, and he was admitted to a hospital for further tests. 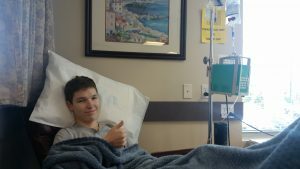 Joey started chemo in July with great anticipation, but after his first week, just as the doctor said, he was really sick. He celebrated his 21st birthday nauseated from chemo. Eventually, when all his hair fell out, he told his mom, “Look at me bald, Mom! I look good!” His strength and attitude were amazing. We never saw Joey cry. I know there were tears, there had to be, but we, his family, never saw them. Likewise, he never saw ours. We were all holding on for each other. We were trying to be brave and sympathetic, but most of all confident that what the doctor had said was true. Encouraging friends back at school. When he got back to school in the spring, the college offered many helpful disability services, like rides to class, preferred seating, etc. It was good to know he’d have support if he needed it. He had multiple teachers who were especially helpful. 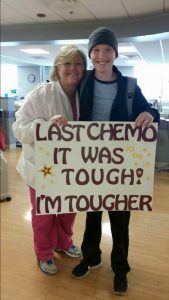 One who had been through chemo could relate to Joey, a couple professors in his department who helped him get signed up for classes while he was still getting treatment, and an old boss in the residence hall that was able to find him a room close to all his classes. They were all so helpful and great encouragers. In March, the commercial Joey had been so influential in bringing about and starred in before getting sick, was released during the March Madness NCAA Basketball Tournament. It is on regularly and you’ll see a large group of kids enjoying Whataburger and socializing. Our Joey is the one doing the talking. Watch for him, our amazing Joey! Since then Joey has gotten MRIs regularly, and so far, all are still clear. They will continue in the years ahead just to be sure. Joey continues to amaze us with his courage and attitude. We, his family, are the lucky ones. He made it easier for all of us. Our amazing Joey! You can read more about June’s life story in her book, You Are Driving Me Crazy! sold on Amazon.